in Media Planning & Buying with tags Amazon Alexa, Artificial Intelligence, Google Assistant, Siri, smart assistants, voice technology Both comments and trackbacks are closed. With the onset of a new year and with minds fresh off of CES, it’s instinctual for brands and marketers to ponder what’s next for media and technology. But perhaps more important is for brands and marketers to examine consumer behavior and ask, “what can we learn about media and technology from you that will set us up for what’s next?” One fast-growing topic that’s worth another look and deserves further consideration is voice technology and the potential it may have for the customer journey, media opportunities and even for a brand’s personality. So , where is the growth happening in voice? It’s true that people have been talking to Siri for years, but voice is just starting to reach its tipping point. Google said 20% of mobile queries are made through voice and the voice marketplace is projected to reach $11.96 Billion in 2022. Not to mention, 55% of teens and 41% of adults use voice technology more than once a day. What’s more, adoption rates of Amazon’s Echo are speculated to have doubled in the early part of 2016. Given this growth, brands need to start seriously considering how voice technology will fit into their media plans and start thinking in beta in order to find success in the voice game. Think first about the software, then the hardware. Voice technology is powered by a form of artificial intelligence (A.I.) software that “learns” from use. For the software to be used by a consumer, it needs hardware that serves as a tool. The technology is commonly built into products with a speaker and a microphone, like our friend Siri (the software) in Apple’s iPhone (the hardware). Over the last few years it has been expanding into every day hardware like appliances, cars, and televisions (think: Internet of Things). The A.I. software is the interesting piece for marketers because it houses the data to be harnessed for continuous innovation. The technology is limited to question and answer formats. The voice A.I. is capable of recognizing audible language, recording data, responding to spoken commands, and actually “learning” how to get better at understanding it’s user the more it’s spoken to. Right now, a spoken question might sound like, “what is the tallest mountain in Asia?” But, the technology is maturing to achieve machine learning and in the future, interactions with voice technology will be more conversational. One would be able to ask the software “what is the name of that movie coming out this Thanksgiving with the blonde-haired actress from Gossip Girl who just had a baby?” and the tech would respond, “Blake Lively”. Another interesting consideration for marketers is that right now the model for voice-based chat is pull, not push, so Alexa for instance won’t interrupt your peace and quiet or conversation with ads or commercials that aren’t specifically requested. The new customer journey requires innovative utility. Voice technology is changing the way consumers do things, the way they think about brands, and how they make purchase decisions. Everything from quick communications like creating reminders, dictating and sending messages, to product searches and completing purchases are all made easier and more efficient with voice. Brands need to think about how their products fit into the way consumers are using voice to determine what value and utility they can provide consumers in this new path to purchase. The landscape is dominated by a few players. Apple’s Siri, Google’s Assistant, Amazon’s Alexa, IBM’s Watson and Microsoft’s Cortana are a few of the key software players in the market competing to be the most adaptable, useful systems to complete everyday tasks for consumers. However, Google and Amazon dominate the current market space for voice. Both Alexa and Assistant are the most conversational, voice-enabled A.I. that can perform tasks, provide information and make purchases for consumers. How have marketers been testing and learning? 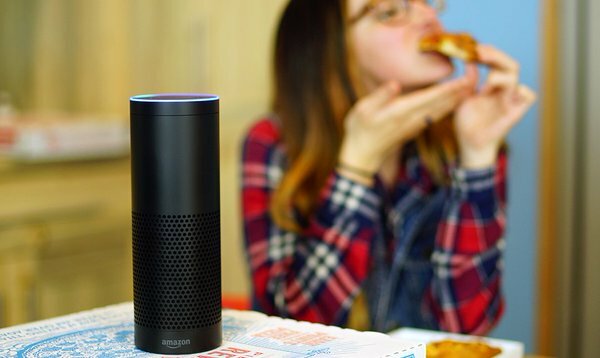 Earlier last year, Domino’s launched Order Anyware built into Alexa on Amazon’s Echo device which allows consumers to reorder a recent order, place a new order, or track an order from their Echo. This is one of many examples of voice technology that change the ways consumers actually make a purchase. Voice also allows brands to reach and speak to their consumers in a whole new light. For instance, Cheetos partnered with Waze to give the brand – and Chester Cheetah – a new voice for the mascot’s relaunch. Waze users could select Chester’s voice to provide them driving prompts which included customized messages based on whether they were driving to work or even taking a road trip. 1. Brand personalities should include a sound palette. Activating in voice requires a new level of two-way conversation that goes beyond what brands are familiar with in social and digital. 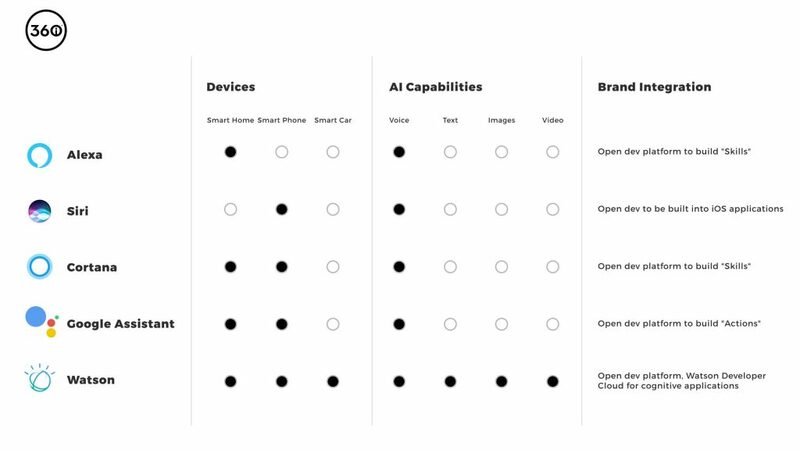 The old question was “What is your brand’s tone-of-voice?” The new question is “How does your brand use that voice to have an unpredictable conversation that provides value?” Activating with voice technology means building audio and conversational dimensions into a brand’s personality. The key will be learning to move from a consistent brand look and feel to a consistent brand look, sound, talk and feel. 2. The path to purchase is no longer a linear path, but a conversational experience. Be ready for changing consumer expectations for added utility. Embrace a test-and-learn mentality to understand how voice technology will affect the way your consumer shops and how your brand is providing in the space. When determining how to activate in voice, start with your brand’s core values and utility. Service-oriented brands will activate differently than efficiency-oriented brands. Stay true to the values your brand uniquely provides in order to create the right experience for your consumers. 3. Voice data delivers new playing fields for media. The real treasure of thinking in beta lies in access to the data early. Currently, Amazon and other competitors in the marketplace are not sharing voice data with partners, but there’s the potential for partners like Amazon to use data collected from voice technology. And really, it’s less about data collection for brands and more about data insights that could become available when working directly with a software provider to run a campaign. For instance, while today brands may run a campaign based on demographics, geography, and device, with a partnership with a provider, like Amazon, there are other data inputs they could use such as voice and purchase behaviors to further refine targeting. As the technology evolves and voice search becomes more conversational, the data and machine learning will not only create new opportunities for media placements but make media even more effective. Eventually, the data from voice could help pinpoint how to know when an ad or organic listing should appear to match the individual search. And, when the intention of the voice command is commercial, voice assistants could also serve as search engine results pages (SERPs) for ads, in which assistants would bypass traditional search engines all together and match voice queries with specific type of shopping ad units. This feature was demoed by Siri’s cofounder, for a new virtual assistant called “Viv” that was recently acquired by Samsung. Think of asking Siri to send your mother flowers for her birthday and Siri showing you lilac bouquets in ad format with prices without leaving the dialog screen. 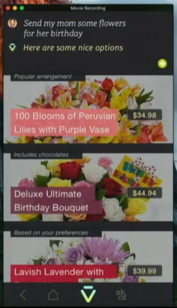 Upon telling Siri which bouquets you like better, she places the order with the florist with your mother’s address, while making the payment with the credit card information that is stored on your phone. Implications for media – whether paid search, display or programmatic – in industries like retail, hospitality, financial, transportation, and food service that can easily display their product/service in a small ad unit within the virtual assistant’s screen, could be limitless. The number of opportunities available will increase as the integration of voice technology proliferates. The sooner brands start testing and learning the further along they will be. In 2017 it will be important for brands to have a “now, new, next” mindset that prioritizes beta-thinking and voice technology: 70% on the now, 20% on the new, 10% on the next- a.k.a. thinking in beta about voice. Contributors: Alison Fraker, Senior Brand Strategist; Natalie Kachadurian, Media Manager; Matthew Turkel, Associate Media Director; Michael Tooley, Media Supervisor and Amie Dowker VP of Strategy at 360i.